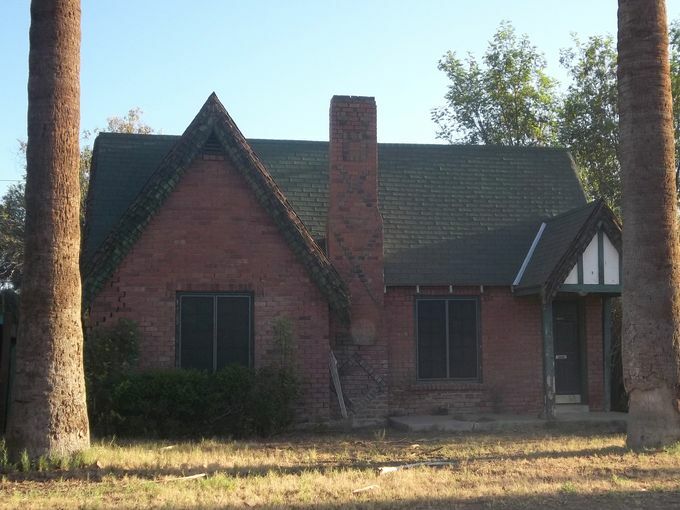 Villa Verde Historic District’s significance is based on its association with historic residential subdivision development in Phoenix between 1912 and 1960. Although Villa Verde is noted for its unique architectural expressions and for its variety within the district, the development follows predominant trends and patterns of subdivision growth in Phoenix during this period. The district takes its architectural cues from Period Revival motifs popular in the late 1920’s and early 1930’s and from Early/Transitional Ranch styles that emerged in the late 1930’s and grew to prominence in the postwar era. The district can be understood and analyzed according to three major historic contexts within the Multiple Property Listing. The first, Context 1: Trends and Patterns of Residential Subdivision Development in Phoenix from 1912-1960, discusses the predominant land subdivision practices in Phoenix from its early expansion beyond the original city limits through the tremendous building boom that followed World War II. 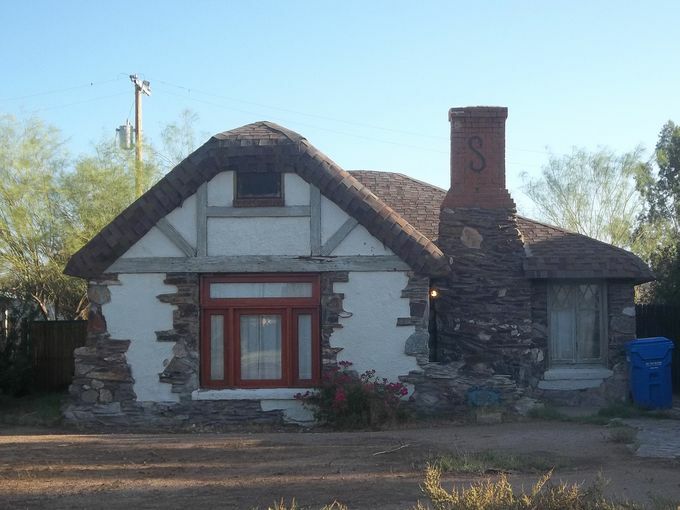 The second, Context 2: The Progression of Residential Architectural Styles, Building Materials and Construction Practices in Central Phoenix Neighborhoods from 1912-1960, details the design motifs and building materials and methods during this period. 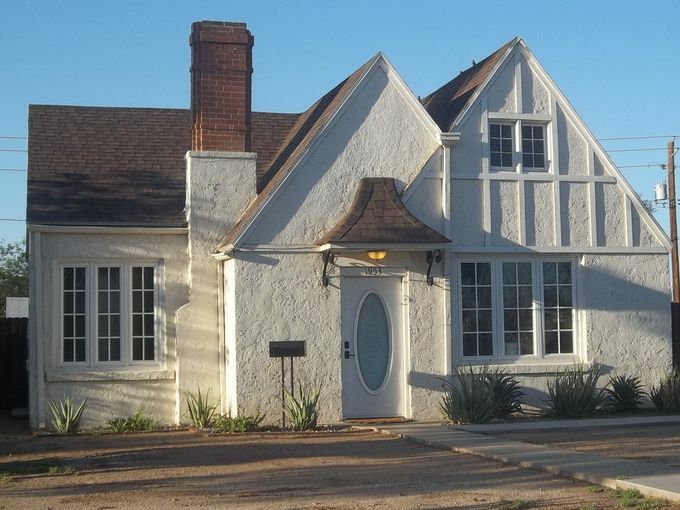 The third, Context 3: Influence of Federal, State and Local Housing and Planning Policies on Phoenix Domestic Architecture and Subdivision Planning, 1934-1960, is relevant to Villa Verde in that construction stagnated in the neighborhood during the economic crisis of the Great Depression and was revived with the aid of federal loan guarantee programs. 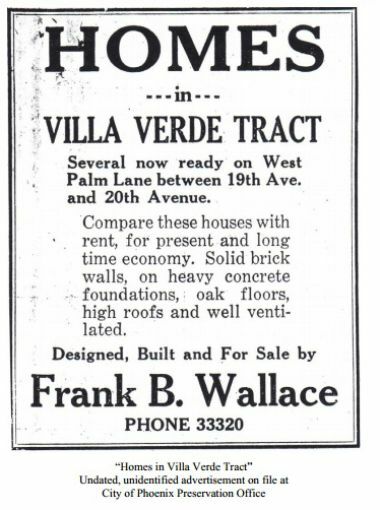 Phoenix builder Frank B. Wallace platted Villa Verde in two related phases: He filed Plat A on February 16, 1928, and Plat B, which doubled the size of the development, on January 27, 1930. The historic boundaries of Villa Verde are identical to its present-day boundaries. Wallace developed Villa Verde street by street, filling each street with houses before moving on to the next block. This contrasted with typical developments of the time that sold individual lots for within an entire plat, a pattern that resulted in seemingly random clusters – and development gaps – throughout the tract. In May of 1928, Wallace wrote to Z. F. Mabee of the Arizona Republican, to provide details about Villa Verde. Wallace made a point of noting that home construction was proceeding lot-by-lot. He also noted that “the tract is thoroughly restricted as to race, set back, cost and type of construction, etc.” The southernmost street, Granada Road, was the first to see construction and it was completely built out by the end of 1928 (See “Subdivider Who Is Also His Own Designer and Building Contractor Sells Four Homes” in the Arizona Republican, November 18, 1928 in Additional Items). Palm Lane would be completed one year later. Once Plat “B” was approved and recorded in 1930, construction began in earnest on Holly Street and it was completed the same year. While the Great Depression halted Villa Verde’s brisk sales and fast construction rate, the last streets finally filled in with modest one-story houses, some of which were early or transitional Ranch designs rendered in compatible size, scale and massing to the earlier homes in the neighborhood. By 1940, the second phase of the project was largely built out and the streets of Villa Verde were filled with small scale, one-story houses built at regular intervals and standard set backs along broad, straight streets. Frank B. Wallace was entirely responsible for Villa Verde’s vision, design, and execution. Villa Verde is unique in that the original developer designed, built, and sold every house in the district. It was Wallace’s project from start to finish. Wallace was not an architect nor a realtor but, rather, an engineer who held degrees from Syracuse University. This may be why his houses were not simply replicas of popular styles but variations on Bungalow, Ranch, and Revival themes of the period. In his own words, Wallace endeavored to build attractive and interesting houses for homebuyers of modest means. He claimed that his specialty was “artistic small homes” that were not just unique in appearance, but also affordable. 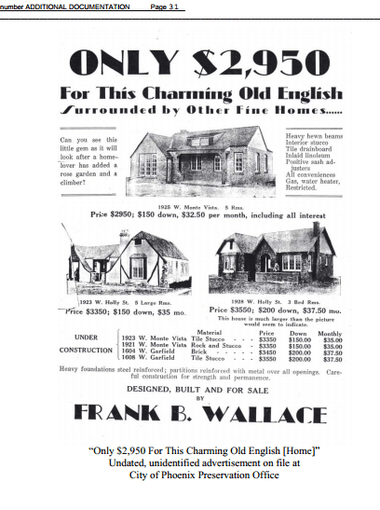 Homes in Villa Verde were generally priced at $3000 or less (See “Only $2,950 for This Charming Old English [Home]” undated, unidentified newspaper advertisement in Additional Items). Wallace embarked on an extensive marketing campaign for his development; large newspaper ads appeared nearly every week during the course of his initial sales. He challenged potential buyers to compare the cost to own one of his houses in Villa Verde with renting elsewhere. He touted the stability of his homes for their solid brick walls, heavy concrete floors, high roofs and good ventilation (See “Homes in Villa Verde Tract” undated, unidentified newspaper advertisement in Additional Items). Like many other developments that sprang up beyond Phoenix’s boundaries at that time, Villa Verde advertised city conveniences without city taxes. Additionally, Wallace boasted that Villa Verde was several degrees cooler than Phoenix proper – an attribute that, if true, that would tempt many city residents. 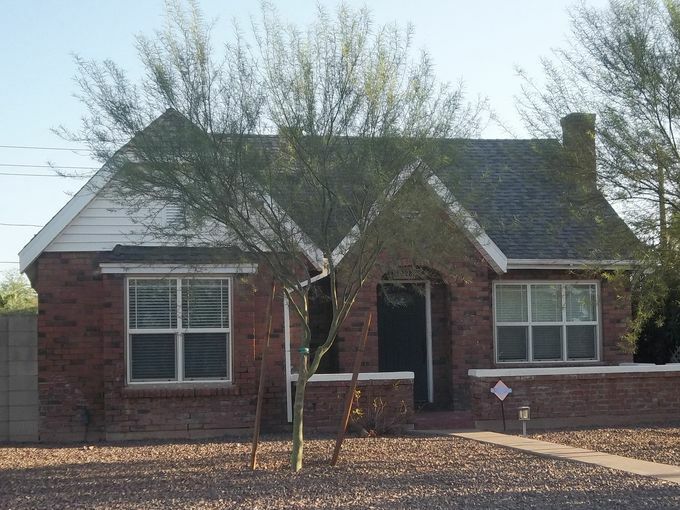 Villa Verde advertisements also drew upon the neighborhood’s convenient location near the Six Points commercial district and its close proximity to the Arizona State Fairgrounds. In fact, while developing the site, Wallace often advertised at various fairground events such as rodeos (Wallace letter, January 16, 1928). Apparently, Villa Verde had been used in the past for events parking. Once he started developing the site, Wallace charged fairgoers twenty-five cents to park on Villa Verde’s undeveloped lots (Wallace letter, January 16, 1928). For some time, Wallace kept four lots on Holly Street vacant as parking for the fairgrounds. Wallace eventually built houses on the lots in the late 1930’s. Wallace attracted a variety of people to his Villa Verde development but most residents were families of relatively modest means and occupations. In 1930, when Granada Road and Palm Lane were largely occupied, residents included F. G. Smith, a manager at Pay’n Takit (1902 W. Granada Road), C. A. Petro, an insurance agent (1922 W. Granada Road), W. H. Hachsettler, a mechanic (1927 W. Granada Road), Mrs. F. E. Woods, a window trimmer (1904 W. Palm Lane), Rev. W. B. McCrory, an assistant pastor (1912 W. Palm Lane), and T. H. Evans, a brick contractor (1922 W. Palm Lane). By 1939, when most of the neighborhood was built out, residents included J. F. Foley, an executive secretary for the Arizona School of Commerce (1909 W. Holly St.), F. R. Monson, a district supervisor for Continental Oil (1920 W. Holly St.), Pete Williams, Apache Cleaners (1928 W. Holly Street), H. J. Denton, Denton Tire Service (1922 W. Monte Vista Road), and H. J. Gannaway, manager of Six Points Hardware (1924 W. Monte Vista Road). Slightly less than half were homeowners and the others renters (Phoenix City Directories, 1930, 1939). The residential mix in the immediate postwar period was similar to that in the 1930’s. Jobs for heads of household remained largely blue collar or clerical. Several building trades were represented by residents who worked as electricians, roofers, and contractors and in clerical positions including an employee at the County Assessor’s Office, a clerk at Standard Oil, and a record clerk. Several active-duty military men lived in the neighborhood. Somewhat more than half were homeowners as opposed to renters. As the postwar period progressed through the 1950’s and into the early 1960’s, Villa Verde’s resident composition tended to be largely working class. In the mid-1950’s, home ownership dropped to only about one-third but it gained momentum and by 1963, more than half of the houses were owner-occupied. In 1955, residents included a policeman, employees for service companies, mechanics, truck drivers and watchmen. Evelyn Davis, a waitress, owned her own home (1928 W. Holly Street). By 1963, there were warehouse clerks, car salesmen, metal workers, carpenters, and a secretary. One of the houses (1926/1926 ½ W. Monte Vista Road) was listed as a duplex with Shirley Hillhouse, a meat wrapper living at 1926 and Robert Speakman, a teacher, living at 1926 ½ W. Monte Vista. Throughout the historic period, Villa Verde had a fairly transient population. Few, if any, residents in 1939 were still living in their houses in 1963 and many houses had different residents from one year to the next. However, the population was relatively stable between 1955 and 1963. People who remained in their houses over time tended to be homeowners, although that was not always the case. Leslie Evans, who owned a refrigeration company (1901 W. Granada Road), Jano Hall, a car salesman (1927 W. Granada Road), Evelyn Davis, a waitress (1928 W. Holly Street), J. R. Blair, a policeman (1905 W. Monte Vista Road), Louis Grossman, president of a dressmaking fabric company (1906 W. Monte Vista Road), J. W. Miller, a truck driver (1924 W. Monte Vista Road), Oneita Clark, a telephone company clerk (1925 W. Monte Vista Road), and W. A. 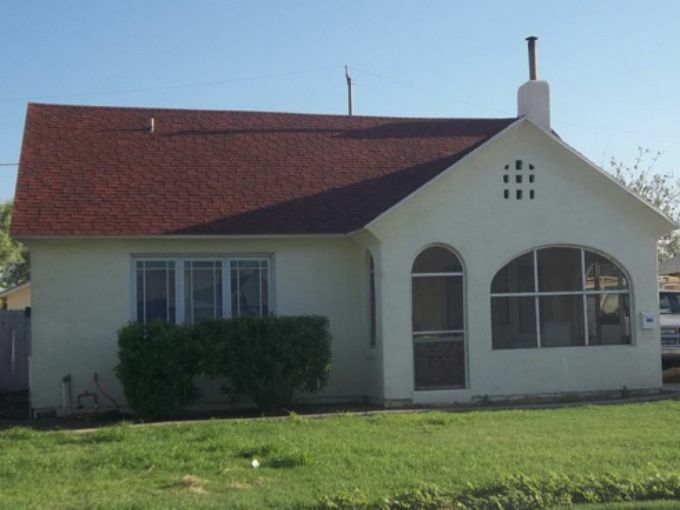 Justice, a ham sacker (1922 W. Palm Lane), lived in their homes in both 1955 and 1963.